As we move into the winter months, bad weather and accidents will become more common. Here are some safety tips and the laws about them. If your windshield wipers are on due to bad weather, your lights must be on. That means actively turning on all your vehicle’s normal operating lights, not just relying on the always-on or dark-activated headlights. Being visible to other drivers in bad weather is key to staying safe on the road. We know…it’s weird to do this when we’re getting sunshowers, but better to feel weird than mad about getting a ticket. Or having your insurance premium skyrocket. 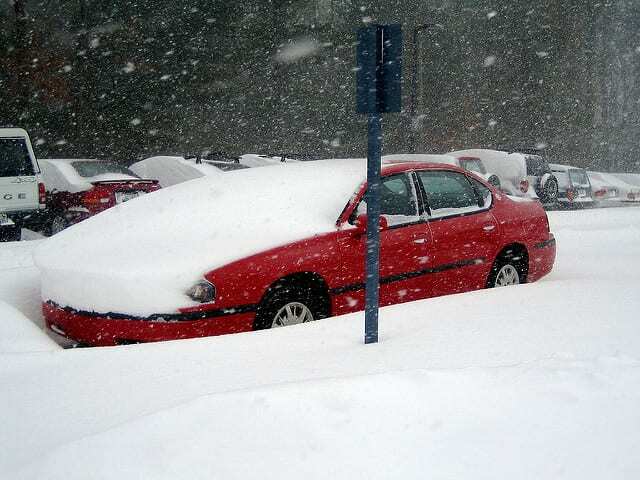 All snow must be removed from vehicles prior to travel. It’s not negotiable, folks—we’re no fonder of shivering and getting soaked than you are, but the law says that pile of snow on your vehicle’s roof must come off. If you own an SUV or pickup or just have trouble reaching across your car’s roof, then a good extendable snowbrush (or a handy kitchen broom – we won’t judge) should live in your vehicle until the snow is gone next spring. Move over and slow down for disabled vehicles and emergency vehicles. It’s not only the safe and courteous thing to do, but it’s also the law. Those flashing lights on disabled vehicles and emergency vehicles on the side of the road are telling you there’s a problem, and people are risking their safety and lives to fix it. Give them room to work instead of being “that driver” who makes the problem worse. Following up on #3, if your vehicle is disabled on the side of the road, use your hazard lights (four-way flashers). We can’t guarantee everyone on the road will be paying attention, but it’s your responsibility to do everything you reasonably can to alert other drivers that a situation exists. Pay attention to and comply with parking bans. They’re put in place during bad weather to make clean up—particularly snow removal—as quick and thorough as possible. We all know some areas have greater challenges than others due to limited space, so complying with parking bans not only means better clean up, it means less chance of your vehicle getting damaged.